Today’s News is tomorrow’s history and the television newsrooms are prolific documenters of what takes place each day, recording events and conveying them to the public. The news camera folk are capturing not only events of the period, but also creating time-capsule elements with each story reported. That’s if their record is kept by News Departments who value the historic significance of their material. This video is a compilation of news bulletin video taken in the early 1970’s by cameramen at TVW Channel Seven in Perth. The News Editor at the time was the legendary Darcy Farrell, who set up the first television newsroom in Western Australia. 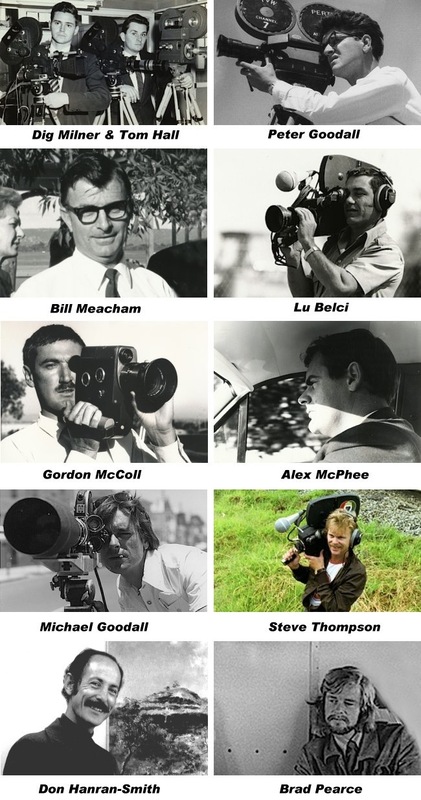 TVW News cameramen during this era included Peter Goodall, Michael Goodall, Lu Belci, Bryan Dunne, Tom Hall, Don Hanran-Smith, Gordon McColl, Alex McPhee, Bill Meacham, Brad Pearce, Steve Thompson, Stan Jeffery, Steve Jeffery, Roger Dowling, Ian McLean and Matt Williams. Special mention needs to be made of Keith (Dig) Milner, as Darcy Farrell reminds us that all of the 1960 Rome Olympics coverage was shot by Dig, who sadly was killed in an air crash later that year. His footage included Syd Donovan’s interviews with superstar crooner Bing Crosby and champion boxer Cassius Clay (later known as Muhammad Ali). Another sad note is that Matt Williams died after a long illness with lymphoma, not long after a car accident which claimed the lives of all but one of his family. All footage shown here was shot on 16mm black and white film, as it was the age before electronic news gathering (ENG). The era of television news gathering with film cameras. Veteran cine cameraman Peter Goodall demonstrates a range of early cameras from an era when film was the prime visual source of television news coverage. The first camera shown is the Bell & Howell 70DR which had an impact when television stations ventured out of the studio and incorporated film into the nightly news programs. Some of the most dramatic close combat footage from the Vietnam war was shot using these cameras. The second camera is the Paillard Bolex automatic loading non reflex 16mm camera which was also a good animation camera. The third camera shown is the Cinema Products CP-16 Sound Camera, which was primarily designed for television news filming and were quite popular before the advent of portable videotape Electronic News Gathering (ENG) formats, as well as for documentary and drama production. They featured a magnetic audio system with a built in mixer that recorded onto special pre-striped 16mm single perforated magnetic sound film. 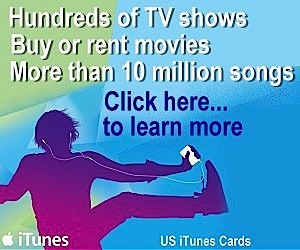 It accepted a 400 foot film magazine. The medium on which our television news coverage was documented has undergone many changes from 16mm reversal film with optical, magnetic or double system sound tracks. Other valued historical content was recorded on two inch wide videotape. Film went out of fashion with the advent of electronic news gathering and the format for recording this has undergone a number of changes to where we have abandoned analogue in favour of digital technology and all its benefits. As videotape equipment and electronic cameras became smaller, film was displaced by the new medium, which required no processing. The early 16mm black and white film was shot on reversal stock, which meant that the film shot by the camera was developed using a variety of chemical tanks to produce a direct positive image. That same film would then be edited and finally taken to telecine, where the moving image was projected onto an electronic camera tube, to produce the television image. The reversal film process avoided the need for a negative stage, which then would have required time consuming printing and further developing to achieve the normal positive image. This means that this State’s history has been recorded on a diverse range of media, which in many cases is volatile. Magnet emulsions shed oxide over time, putting in danger any old recordings made on videotape, double system, magnetic stripe or audio tape. Many of the television news stories held by the WA State Library are missing the sound tracks by virtue of the double system sound not being part of the transfer to DVD. From 1959, TVW meticulously kept their news film, sound film and scripts in thousands of cans, each representing a news bulletin. A wonderful resource for a historian. Though in later years an abortive attempt was made to extract the silver content from some of Seven’s film library, fortunately only a proportion of the archive was destroyed. Silver was also extracted during the film processing stage at Seven’s Group Color division, using an electrolysis process. This used a well established technique which caused no harm to the processed film. Thankfully to the culture of the Sir James Cruthers era, much archival material still exists at TVW, though his beloved museum of aircraft, locomotive, trolly bus, significant vehicles and much memorabilia has been dispersed during the Robert Holmes à Court reign. We are fortunate that dedicated staff hid important artefacts to ensure their survival. Now the ravages of time will be the enemy of their survival, unless ongoing conservation becomes a routine. Thanks again Ken for another of your excellent stories. Your endless efforts to keep our memories alive and endeavouring to record the history of our time is greatly appreciated by us all. 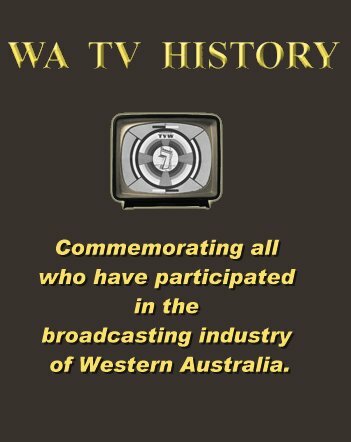 Hopefully the younger generation will thank you in future years for creating this excellent record of Western Australia’s television history. Knowing some of the names you mention and having also worked alongside and with Peter Goodall on many projects in the past, it brings back lots of memories. Thanks again Ken, keep up the great work. It was remiss of me to not point out that the quality film transfer was kindly provided by you and your happy face and most helpful services will be very much missed since your move to New Zealand. Though your new location does seem like a little piece of heaven not only from a scenery point of view but the lack of flies and mosquitoes and the opportunity to enjoy moderate temperatures. know that TVW was the best, I have some VHS COPIES of some of the docos. Ken you are doing a great job so I would like to remind you that there were some great back room men that have been missed. David Gordon the stills photographer who is still alive and living at the same address. Steve Thompson was his assistant. John Quick who was heavily involved with the electronic engineering that kept the station on the air and of course there was Jan who looked after the houston Fearless film processing machine and also we forgot the real man in Ray Irvine. Whilst Jimmy Curthers ran the show it was one big happy family and as a supplier it was always a pleasure to serve the many diverse requirements that TVW had. Great to see some of this footage again. Was Perth that stripped of trees in the 1960’s and 1970’s. I always thought it was hot going into Perth in those days! It’s probably time that I handed over some of the equipment that my father, Tom Hall used in his time. I’ve the original studio TVW video camera tube which gave Perth it’s first images over the TV. Sorry TVW – you don’t have the original one and a few other things in regards to film cameras. I would rather these were seen by others and not just sitting in a cupboard here with me. They “aren’t for sale” but for permanent loan to Perth historical archives.